In honor of National Pet Memorial Day, Angel Truffles is joining the Sunday Selfies blog hop this week. The famous Dr. Seuss quote that I added to her picture is one of my favorites, yet in all honesty I'm just not there yet. I still can't accept that she's gone and don't think I will for a very long time. 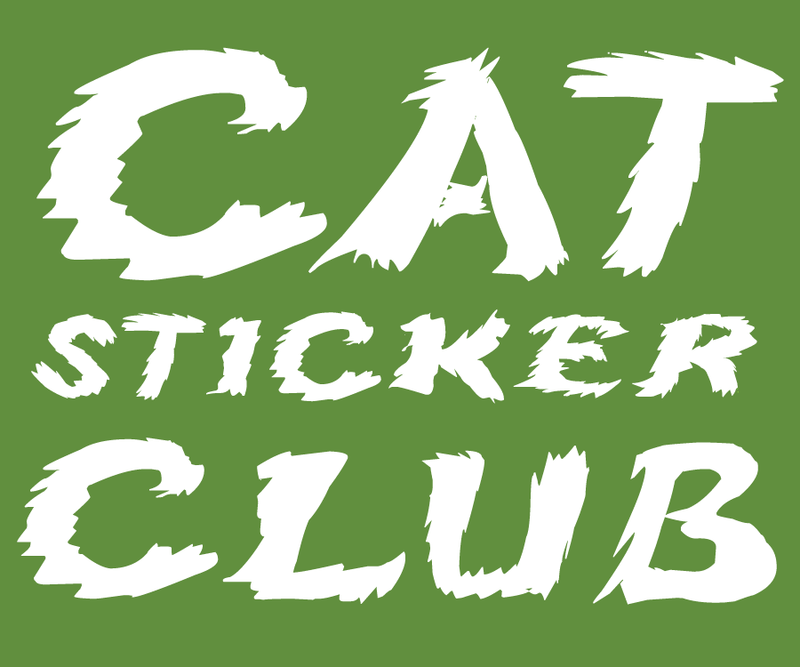 About a month ago I entered a contest by two of my favorite authors, Joyce and Jim Lavene, to name the pet characters in their upcoming book A Dickens of a Murder. 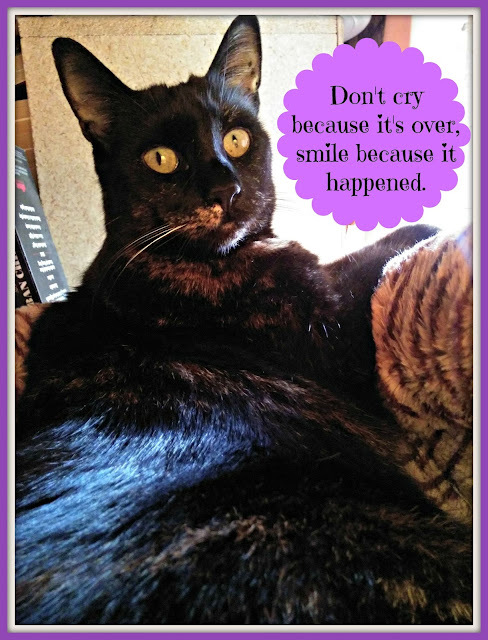 Not only was Truffles chosen as the tortie in the book, her character is on the cover that was just revealed this week, and I've been told that she's very special to the story as well. As a Christmas and Dickens fanatic, I just can't even begin to express how special this book is going to be to me. A Dickens of a Murder will be released on November 3rd, but you can pre-order today! THAT was a wonderful quote, and our mommy needed to hear it today because of her daddy and all. Purrs to you on this memorial day! Wonderful quote from Dr Seuss. It is easy to agree with it, but hard to follow when you are sad. I totally understand about the quote, Melissa. 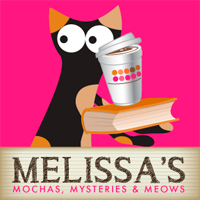 I love, Love, LOVE Truffles being chosen for the tortie in A Dickens of a Murder (and love the cover)...can't wait to read it! It's a beautiful tribute to Truffles. The book sounds very interesting! That is such a special way to remember Angel Truffles. It is a wonderful wise quote from Dr Suess, but even after more than 2 years I am not there yet either. Closer I suppose but definitely no where near ready yet. Excellent quote and beautiful picture. It takes a long time and there's no hurry. We all grieve in our own way. It will be two years since I lost Pip (our Yorkie who started the blog) in October and I still have my moments where I miss him so much and just can't believe he is gone. Whoa! Concats to Angel Truffles! That’s a BIG deal! So cool to have Angel Truffles in a new series - what an honor! I just might have to start (another) new series!! Beautiful quote; It takes time to heal, even if one has several fur babies when losing the one most attached to. Her love is in your heart and always will be, and the pain will subside; will pray for you! Blessings! Dat's pawsum. And da quote be so twue. Have a blest day. That is so special! What a wonderful way to remember Truffles. That is a wonderful and lasting tribute to Truffles. Oh My ! What an honour!! Truffles will be forever remembered in print!! What a wonderful tribute to Truffles! 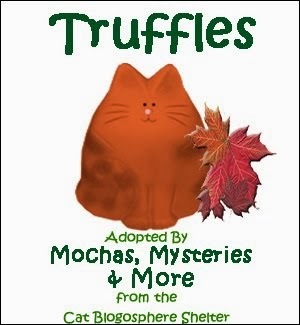 How awesome that Truffles was chosen for the book. What a wonderful tribute to your beloved Truffles. 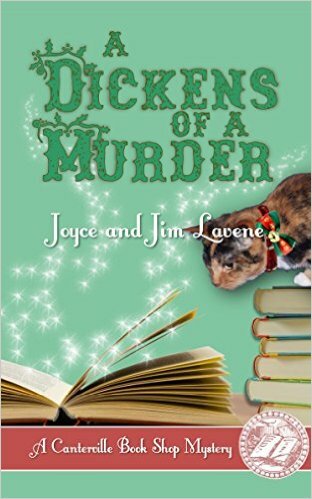 Knowing the story behind the Lavene's tortie in A Dicken's of a Murder will make reading the book a special experience. Our sweet pets leave paw prints on our hearts that never disappear. 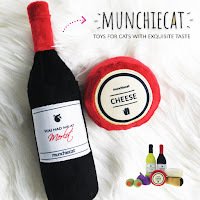 What a nice way to honor Truffles! 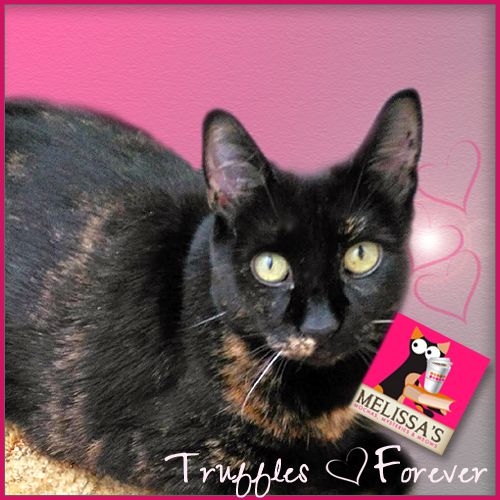 I am so thrilled to hear this about Truffles beautiful honor, and I am so happy to see her sweet face for National Pet Memorial Day! I can't wait to read the book with "Truffles" !! !